Selected testimonies to living history—speeches, letters, poems, songs—offered by the people who make history happen, but are often left out of history books: women, workers, nonwhites. Featuring introductions to the original texts by Howard Zinn. New voices featured in this 10th Anniversary Edition include Chelsea Manning, speaking after receiving her 35-year prison sentence; Naomi Klein, speaking from the Occupy Wall Street encampment in Liberty Square; a member of Dream Defenders, a youth organization that confronts systemic racial inequality; members of the Undocumented Youth movement, who occupied, marched, and demonstrated in support of the DREAM Act; a member of the Day Laborers movement; Chicago Teachers Union strikers; and several critics of the Obama administration, including Glenn Greenwald, on governmental secrecy. From Walter Mosley's Workin’ on the Chain Gang (2000), featured in Voices of a People's History of the United States. The slaves in America and the serfs in Russia were freed at about the same time. The chains were laid out in front of them and the doors to the plantation were opened wide. Most slaves, most serfs, stayed on the plantation of their own accord, not because they liked it but because survival seemed reliant upon servitude. Today the worker accepts more hours at a lower wage (or at an equal or higher wage that has lower value) or fewer hours, which mean the loss of health care and other benefits. All this for profit. When a slave is freed you can be sure that it is because she will make more profit for the plantation boss as a free agent. When a worker is lauded he’s probably sweating gold. Profit is made on a grand scale in America, but most of us don’t share in it. Most of us work for dollars that fluctuate in value, at workplaces where the managers never really care about us or our hearts. We live within the margin of profit. We are the margin of profit. The money taken from our labor is used to buy political power that does not represent us. Our taxes pay for federally licensed air waves we do not control, for S&L [savings and loan] bailouts, for public inquiries into the president’s privates, and for law enforcement agencies and judges who can’t keep heroin out of our children’s reach. Broken roads and nonexistent stoplights, children who can’t read, and prisons that are private businesses—this is also the margin, the margin of profit. The verb, then, is marginalize. We are marginalized by the profit of capitalism. We are footnotes to Citibank and the Mobil Oil Corporation and Chiquita Brands International (once known as the United Fruit Company). We are the edges that form the outline of the behemoth that tells us he is the only way. God, this monster would have it, is defined by the margin of profit. We pray to him and sacrifice to him, we give our children up to him, and he’s never given a single sign that he cares. This is because he cannot care. Labor is a commodity that is useful only as long as it is disposable. Working hands can be replaced by cheaper or more efficient labor, but if those hands can’t be cut away at a moment’s notice, they become a liability. The world of profit is a world of plunder. Advancement is defined by this margin but not by the quality of life or goodness. Fair, for profit, is what you can get away with. And everything is a commodity—love and hatred and the drugs you need to keep on breathing. If profit is the only way, that is a sad state of affairs. It’s a locked door, and somebody has thrown away the key. . . .
I’d like to say that the answer to the problem is the simple abandonment of the economic system that rules us. We should all work together, we should all live well. Give our all and share in the wealth; it’s a beautiful notion, and maybe our children’s children will have learned enough to make such a world work. But we, like the slaves of the nineteenth century, have been conditioned to imprisonment defined by the alienation of our labor: We give 100 percent and receive somewhat less in return. We take what we are given and make what we can of it between the demands placed upon us for the privilege of freedom. Fine. For the moment, let’s accept the system. Let’s agree that the corporate, capitalist, alienated form of labor is what we have to work with. Still, can’t we make a few demands? Can’t we ask a few questions about ourselves on the coffee break and during commercials? The margin of profit, among other things, defines our labor; more, it defines our humanity. The job you hold, the income you bring home, the recognition of your value to society, are all deeply informed by your labors. And if the system defines you, then it owes you something too. The question is, what are you owed? This question must be articulated and answered by at least 10 percent of the population. Ten percent is an arbitrary number. I’m simply saying that the number of people that it takes to make political change is actually quite small. A fraction of the populace that is sure of what changes are necessary can change the minds of their neighbors. Truth . . . comes in small packages. During the twelve weeks of abstinence from arena sports and electronic media you could ask yourself what it is that you deserve for a lifetime of labor. Make a list. Share it with whoever will listen. Maybe you think that a medical bill of rights makes sense. Maybe you think that every American child deserves an excellent education. Maybe you believe that the child-bearing job, not yet a property of capitalism, should be remunerated and revered by the state. Write it down and spread it around. Maybe we need more doctors and scientists, and maybe the output from these laborers should be the communal property of the people. Maybe the margin of profit that works for cornflakes should be monitored more closely when it comes to medicine and war. Maybe profit and medicine don’t mix. Maybe you need a place to sleep and you won’t sleep soundly until you know that everyone is safe and sound here in the bosom of the richest nation in the history of the world. Make a list; put it in your wallet. Take it out now and then to tinker with it or expand it. Make decisions based on this list. Vote by it and argue for its claims. Compare the ideas of your bosses and political leaders with what you think is right. Then make another list, this time of those people and systems that support your notions. Notice who and what is missing from this list. The goals of revolution are realized by personal enlightenment. Don’t buy somebody else’s list; don’t clip one from the newspaper. It’s not in Mao’s “little red book” or in the Declaration of Independence either. Any life that you can attain must be, in part, the production of your own mind. What you need is missing from your life right now. Reach out for it. Define it. Then demand it from the world. This simple exercise is nothing new, I know. I am not trying to innovate. Innovation, when it comes to a population in the billions, can easily lead to mass murder. I’m simply trying to lay a few notions next to each other: the margin of profit to the right, a list of my demands to the left. The TV is off, the election is next year, it’s evening, and, like Sisyphus, I have a few moments before I have to continue the labors forced upon me by the gods. Once you throw your chip into the game, the odds are changed, the revolution of enlightenment gains, and the margin of profit quavers toward a counter move. 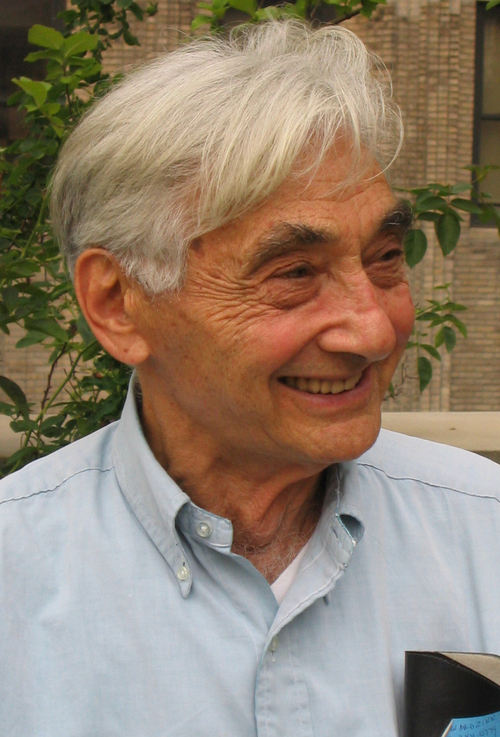 HOWARD ZINN’s (1922–2010) great subject isn’t war, but peace. After his experience as a bombardier in World War II, he became convinced that there could be no such thing as a “just war,” as the vast majority of modern warfare’s victims are made up of innocent civilians. In his books, including A People’s History of the United States and its companion volume, Voices of a People’s History of the United States, Zinn affirms the power of the masses to influence major events. Through a lifetime of pointed scholarship and principled civil disobedience, he has led and continues to lead generations in the ways of peace. by Dennis Loo, Peter Phillips, et al. by Kurt Vonnegut, Micah Ian Wright, et al.